Journey with Gopi and Braja to the land of yogis and mystics, where mantra is an embodied transformative experience, food is an art of spices and flavors, and ritual a ray of color and beauty. 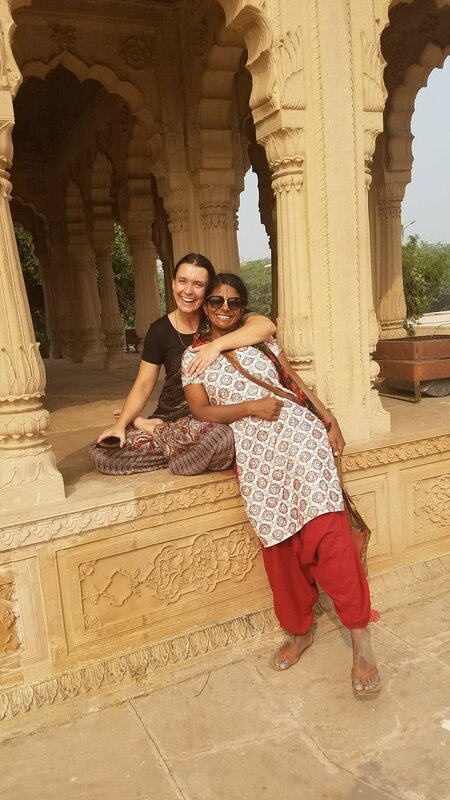 These two creative and skilled yoga teachers have extensive experience living in ashrams and traveling in India, and will be your guides to a side of the country barely glimpsed by the average tourist. Full cost is $2850, which includes all internal travel, food and accommodations. A $500 non-refundable deposit is required to register. Vrindavan is the birthplace of Lord Krishna, a place of pilgrimage for Hindus and home to over 5000 temples, large and small. Sacred chanting resonates throughout the town, which is considered to be the “Heart Altar” of Bhakti yogis, those who follow the path of devotion. Our Vrindavan pilgrimage will include a boat ride on the sacred river Yamuna; visits to some of the oldest temples in the area; a day at Vrindavan Food for Life, a wonderful charity that provides education and much more to very poor children to help break the cycle of poverty, and also has many other impressive initiatives including environmental programs, a medical facility, and an animal sanctuary; and a trip to Govardhan Hill, whose spiritual potency draws thousands of pilgrims each month. Of course, we'll also do yoga every day. Rameswaram is another pilgrimage place filled with blessings and the powerful energy of worship and prayer to Lord Rama. This is the auspicious place where Rama built a bridge to Sri Lanka to rescue his wife Sita, who was kidnapped by Ravana, the force of evil. Rameswaram has ornate corridors, huge sculpted pillars and sacred water tanks. Gandamadana Parvatham is a hill with spectacular island views. A chakra (wheel) here is said to bear an imprint of Lord Rama’s feet. This is the place where Lord Shiva, the god of destruction, offered his prayers to Ram. These ancient stories come alive when visiting these holy places. They are a vortex of sacred energy and power held in time and space and when we visit we are allowed to enter, relive and rejuvenate our sacred heart center. 1 days in Mahabalipuram. 1 day Puducherry. Mahabalipuram is a World Heritage site where temples and carvings of ancient archaeological wonders depict stories from the yogic teachings and forms of Gods and Goddesses in play and action. The monoliths inspire and enflame the imagination and the sunsets are magnificent. Enjoy the salty air and coastal beauty of the Bay of Bengal beaches. The town is also a vibrant place, great for shopping! Tiruchirappalli is an ancient city in India's southern Tamil Nadu state. The Kaveri and Kollidam rivers flow around Sri Rangam Island, the sacred site of Sri Ranganath Temple. It is one of the most illustrious bhakti temples in South India, rich in legend and history, depicting a sacred form of the reclining Vishnu. The Srirangam temple is the largest temple compound in India and one of the largest religious complexes in the world. Some of these structures have been renovated, expanded and rebuilt over the centuries as a living temple. The energy still remains, surcharged with devotional bhakti ritual and mysticism, it has become a portal of Grace. Its beauty and architectural design will inspire love and reverence in the heart . Tiruchirappali has intricately carved gopurams (towering gateways), leading into other magnificent temples, like the Jambukeswarar-Akilandeswari Temple, dedicated to the god Shiva. The Rock Fort Temple complex towers over the city center.